Many cycling enthusiasts are taking to occasionally riding single-speed bikes. While these people typically have other bikes with wide ranges of gears, their singlespeeds are usually a "spare" bike, something to take out when they're looking for a little different riding experience. With modern bicycles coming standard with 21, 24, 27, and now even 30 gears, why would anyone want to go back to riding with no ability to change gears? Sometimes you just might slip into a "been there, done that" attitude when it comes to cycling, and want the experience of tackling familiar terrain, with all its usual ups and downs, but with the extra challenge of not being able to change gears. Singlespeed riding can build strength; riders that occasionally train using a singlespeed bike often find that they feel much stronger and faster when they go back to riding their traditional geared bike. Some people use a singlespeed as their "around the neighborhood" bike, when you don't need to get all dressed up in your spandex and cycling shoes, but just want to grab-and-go for quick errands, a casual spin with the kids, or on easy, flat terrain like the Towpath or other bike trails. Many people use a singlespeed as their "foul weather" bike, for commuting or other situations where they want to get out and ride no matter what the conditions, but don't want to muck up their "good" bike. The singlespeed drive train is simpler and quieter, with less moving parts, and less potential for something to break or become out of adjustment. This simplicity also speaks to something more primal in some rider's minds. Without having to think about shifting, they connect with the road or trail in a deeper way, conserving their momentum, feeling the terrain, appreciating the freedom of movement that they had when they first learned to ride as a child. "Free your mind, and your feet will follow," some say. From my own personal experience riding a singlespeed mountain bike, I've found that I end up riding a little more aggressively and faster overall, because as I am cruising along on descents or flats, I tend to ride my brakes a little less, knowing that I need to conserve that momentum to help me up the next climb. Most singlespeed bikes still give you the ability to coast. A singlespeed that does not allow you to coast is called a fixed-gear bike. With a fixed-gear bike, if the bike is moving, your feet have to be moving, too. The most obvious difference in the design of singlespeed bikes compared to geared bikes is, of course, the absence of shifters and derailleurs. With a geared bike, the chain has lots of "slack" to allow it to wrap around all of the smallest and largest gear combinations. 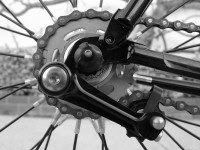 The rear derailleur's spring mechanism moves to take up the slack when less chain is needed. With a singlespeed, there is no derailleur to take up slack in the chain. It's impossible to cut a chain to the exact length needed for the gears, so the frame must be designed to allow for adjustment to the chain tension. The most common method is called horizontal dropouts. The dropouts are the slots where your wheel's axle is inserted into the bike frame. Horizontal dropouts let you pull the wheel back as far as necessary to pull the chain taught, and you then tighten the wheel in place in that position. 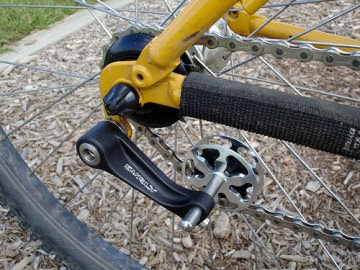 This system is most common on BMX and track bikes, which usually have rear-facing dropouts (the open end is toward the back). Some bikes have forward-facing dropouts, where the opening is toward the front. The advantage of horizontal dropouts are that they are the simplest, and therefore probably most reliable, solution. The disadvantage is that in most cases, you must use a bolt-on hub in your rear wheel, instead of a quick-release hub. This is because a quick release typically does not hold the hub in place with enough force to counter the force of the chain trying to pull the wheel forward. 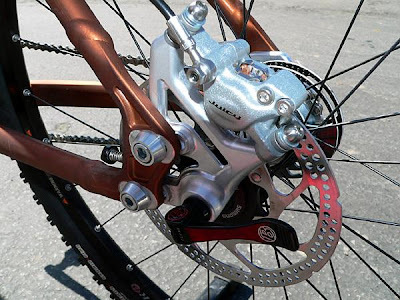 Also, horizontal dropouts make using disc brakes more difficult, sometimes impossible, since the fore-and-aft position of the brake caliper usually can't be adjusted to match the position of the wheel. Another solution to the singlespeed chain tensioning issue is called sliding dropouts. Sliding dropouts are separate pieces that are bolted onto the main frame of the bike. The actual dropouts are vertical (like on a geared bike), so you can still use quick release hubs. Then, to adjust the chain tension, you slide the whole wheel and dropout assembly forward or back as needed, and tighten the dropouts in place to the frame. With disc brakes, the brake caliper is attached to the dropout, so the brake moves along with the wheel, solving the disc brake issue. The third popular design on most ready-made singlespeed bikes is called an eccentric bottom bracket. 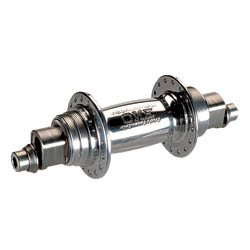 The bottom bracket, as you may remember from this past TechTalk post, is the set of bearings and axle that connect to the pedal crank arms. 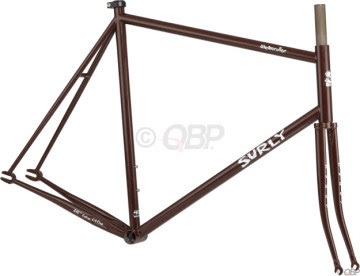 With an eccentric bottom bracket, the bottom bracket shell of the frame is larger than usual. Inside the shell, a metal sleeve is inserted, and this sleeve contains offset holes that are threaded to accept the actual bottom bracket. 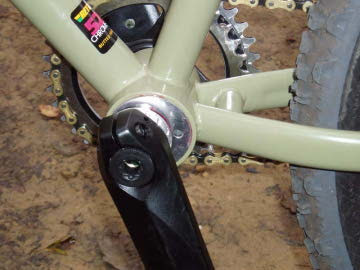 By rotating the sleeve, the relative position of the bottom bracket can be adjusted, thus providing a way to take up the slack in the chain. So, to get their feet wet and try out singlespeeding for the first time, many folks take an old, seldom-used geared bike out of the basement and and convert it to a singlespeed. The problem is, what can you do if this bike has neither horizontal dropouts, sliding dropouts, nor an eccentric bottom bracket? The solution is to use a chain tensioning device. This device looks like a simplified rear derailleur, usually with just one pulley. It attaches in place of the old rear derailleur, and has a spring mechanism that pushes or pulls the chain taught. You'll pick a single cog to use on the rear hub, and use a set of spacers to take up the remaing space where the other gears used to be, and position the cog in line with your front chainring. This setup works pretty well for most road and bike path riding conditions. This method should be avoided for serious, technical off-road riding, though, as it's typically not durable enough to handle the strains placed upon it with this kind of riding. Another option for converting a bike to a singlespeed is an eccentric rear hub. This operates on a similar principle as the eccentric bottom bracket, but the adjustment is done at the rear wheel rather than the bottom bracket. 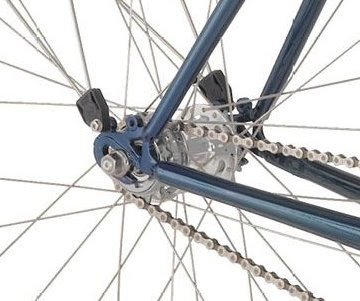 The axle on the rear hub is positioned offset in relation to the points where it inserts into the frame dropouts, and the amount of offset can be re-adjusted, thus providing a way to tension the chain. This is a much more elegant and durable solution than a chain tensioning device, and is suitable for off-road riding. The downside of this option is the expense; eccentric rear hubs start around $160, and you'll probably need to have your bike mechanic custom-build a wheel around it, so figure on about $25 and up for a rim, $1 for each spoke, and about $50 for labor. Pictured below is the White Industries "Eno" Eccentric Rear Hub: Finally, the big question when it comes to singlespeed riding is, "What gear do I want?" That depends on where you'll be riding. For off-road riding, a typical singlespeed gear combination is a 32-tooth chainring up front, with an 18-tooth cog on your wheel. This gives you a low enough gear to be able to crank up most of the steeper climbs you find on a mountain bike trail. If you tried riding this bike on pavement, though, you'd find that you'd be spinning your feet out, and "going nowhere fast." For road riding, most people find that a 42-tooth chainring and a 15- or 16-tooth cog make a good combination, enabling you to maintain a good, steady pace on flat terrain, with a gear low enough to climb up typical road grades. Single cogs are not very expensive, so once you get the bike set up, it's easy to experiment with different-sized cogs to find the gearing that works best for your needs. My, you are a wealth of information today! I'll have to agree with Mitch--that's a great tutorial on single speed and some of the related options--and it's understandable. Nice work! That's funny you should mention that, because I first heard about the Excentricker not long after I posted this article. It looks like a nice solution, and seems like it would work pretty well, but none of us have any first-hand experience with it. The only downside I can see is that it's only compatible with a Shimano Hollowtech II crankset, so if that's not what you already have, you'd need to invest in a new crankset. Very good tech piece. Thanks!